Made to order, hand crafted Genoese style antiqued metal chandelier with gilded metal and glass leaves, glass petals and clear and amethyst hand blown glass drops. Available in any size (standard size shown below). Gilding can be made brighter or silver leafed. Glass can be supplied in other colours or made with all clear glass. The chandelier can be electrified for any country. Hanging chain, either plain or decorated with matching leaves and glass drops, and ceiling canopy can be ordered separately. Standard weight approximately 13.5 kilograms. 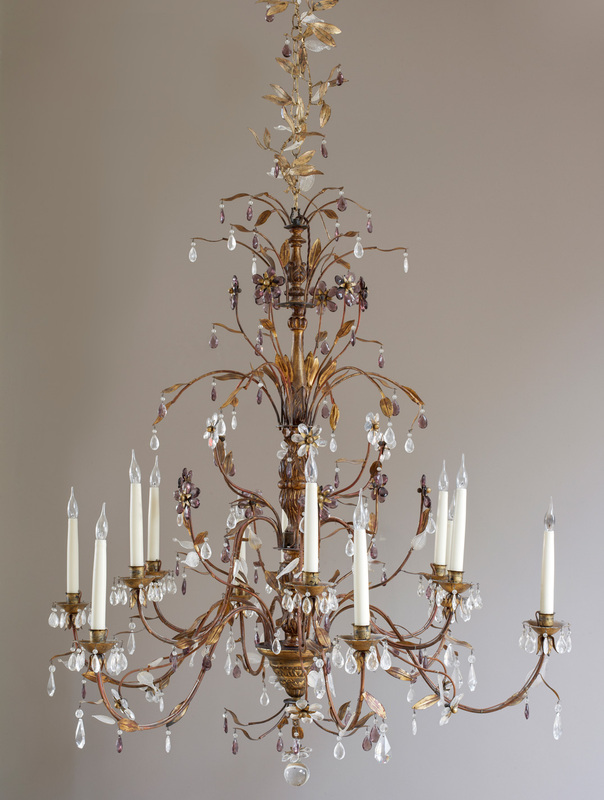 Please note that Charles Saunders is the agent for this chandelier designed and made by Cox London.